Excellent product with prompted delivery. 6. Natalie Eaves, DFR Roofing Ltd.
Easy to use, doesn't use up too much desk space, very happy with it. Excellent, does exactly what it says on the tin! The hardware is excellent worth the price, however, the \"Scan Snap\" software could be a lot better. 9. Mihaela Sandu, Satin Design Ltd. The scanner is so small and fast, it helped me a lot with my paperwork. Really happy I bought it and I already recommended it to other people. 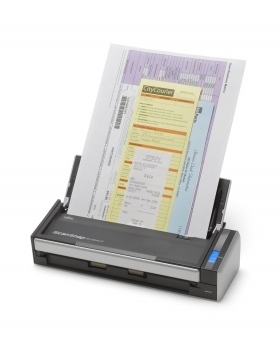 ScanSnap S1300i scans both sides of each page at up to 12 pages per minute directly to PDF, searchable PDF, JPEG, or to office applications like Word or Excel®. The ScanSnap S1300i automatically recognizes the size of each document, detects and corrects for skew, and shows images in their proper orientation. You can even choose to have blank pages automatically removed. ScanSnap S1300i comes with an AC Adapter but for added mobile convenience, the ScanSnap S1300i can be powered though the computer’s USB ports* when an AC power source is not available. * Rack2-Filer is provided as a 30-day trial only with this product. For full license version, see S1300i Deluxe Bundle (Part: PA03603-B015). Scan to PowerPoint® and Rack2-Filer not available on Mac version.